Lucien Young : The Real Hawaii, 1898. Doubleday & McClure Co., New York,1898. Gibson Bros., Washington D.C., 1898. A U.S. Navy officer on the cruiser Boston describes the reign of Lili'uokalani, her overthrow, the Provisional Government and the Republic. Includes chapters on games, religion, land tenure, etc. Lucien Young had a long and distinguished career in the United States Navy. He eventually rose to the rank of ??? While in Hawaii, Commander Lucien Young USN led the occupation of the Arlington Hotel grounds in Honolulu in January 1893. This was the childhood home of Queen Liliuokalani who the Americans under the guise of ''protecting American lives'' would illegally aid American businessmen in Honolulu to overthrow. John Wiley and Sons, New York. 1898. Annual Reports of the War Department for the Fiscal Year Ended June 30, 1900. Washington: Bureau of Navigation, Navy Department, 1888. The native Hawaiians are natural sportsmen, and some of their games would favorably compare with those of civilized races. One of their most popular and delightful sports was surf-riding. Familiar with the sea from birth, they have no dread of it, and are as much at home in the water as on dry land. frequently convex on both sides. The natives choose a place where the deep water reaches to the beach and where the surf breaks violently. They take their boards and pushing them ahead swim perhaps a quarter of a mile or more to sea, dodging the billows or diving under them as they roll towards the shore. the largest billow, paddle with their hands and feet toward the shore. that would prove fatal to even the best American swimmer. The larger the waves, in their opinion, the better the sport. They have a variety of games, and gambol as fearlessly in the water as the children of the United States do on their playgrounds. Occasionally a light canoe, holding from one to half a dozen people, is used instead of a board. This is less difficult than board-riding, and is one of the favorite amusements afforded tourists at the Waikiki beach, a few miles from Honolulu. In the olden times all ranks and ages were equally fond of this sport, but when the king or queen or any high chiefs were plaving in the surf none of the common people were allowed to approach the place. The importance attached to the supply of fish food caused canoe-making to be one of their greatest industries, which, like all other works of a similar nature, was accompanied by superstitious incantations and ceremonies. When completed the canoe was christened, not by the breaking of a bottle of wine over the bow, but by sacrifices to a particular god of the sea. In the case of a large canoe for some noted chief a human sacrifice was necessary to insure its safety and lucky voyages. These canoes w r ere low, narrow and light, drawing but little water and made out of a single tree. Some of them were upwards of fifty feet long, one or two feet wide, and sometimes more than three feet deep. earthy and vegetable materials, in which the bark and oil of the kukui tree were the principal ingredients. On the upper edge of the gunwales was neatly sewed a wash-board or small strip of hard white wood about six inches wide. These wash-boards met and closed over stem and stern. The tackling was very simple, consisting of a stub mast supporting a sail made of mats in the shape of a sprit. The paddles were large and strong, with an oval-shaped blade and round handle, and were made of the same hard wood employed in building the canoe. Neither the canoe nor paddles were carved or ornamented, but were nevertheless very neat. To give the canoe greater stability and steadiness, curved outriggers extended to one side and supported a narrow float, giving the whole the appearance of a catamaran. In these canoes the natives would go through any kind of surf, with a velocity that would excite the apprehension of any man-of-war's-man, were he even in a good whale-boat. Should they capsize, the natives swim around, right the canoe, and get in as though no accident had occurred. 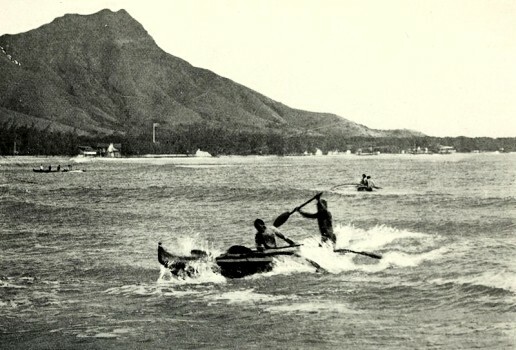 Geoff Cater (2006-2016) : Lucien Young : Waikiki Surfriding, 1898.